Mike Lowdell kicked a late penalty to earn Brackley a hard-fought victory in Midlands Fours East South. Brackley came from behind to lead at Thorney on Saturday before the hosts mounted a late comeback to draw level only for Lowdell to dash their hopes. It was clear from the start that Brackley wanted to move the ball and Thorney wanted to keep it in the forwards and play a more direct game. Straight from kick-off Brackley put the pressure on and kept Thorney pinned in their own 22 but could not get on the score board. Thorney put some pressure on once they got behind Brackley’s defensive line. Thorney’s scrum was dominant in the first half which gave them clean ball and disrupted Brackley’s possession. But Brackley’s defence remained strong when they were pinned on their own five metre line. That caused frustration in Thorney’s ranks and they gave a lot of penalties away. The pressure finally broke Thorney and a break from just inside the ten metre line saw the ball go through a few hands before Gareth Rees swooped on a loose ball to open the scoring. After the restart, Brackley found themselves on the back foot straight away. Thorney came out with purpose and very direct with their play as their game plan suggested. Brackley found it hard to keep the line and that inevitably led to Thorney going over for their first try. From the kick-off Thorney piled the pressure on again and Brackley were unable to get back into the game. Thorney capitalised by going over for their second try. Lowdell kicked a penalty and Brackley kept the pressure on, good interaction between the forwards and a backs gave full-back Jon Cooper the opening to score in the corner. Thorney forced Brackley to give a penalty away which Thorney kicked to draw level. 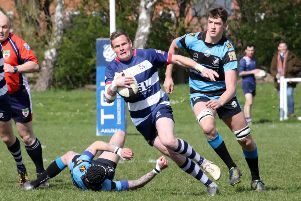 But Thorney were reduced to 14 players following a yellow card offence after a shoulder charge on Lowdell and Brackley looked to capitalise on the man advantage. With two minutes left, Thorney sealed off at the breakdown on their own ten mete line but a lack of discipline saw the referee move the penalty ten metres towards the line and Lowdell composed himself to slot over the penalty and win the game.